Dozens of trees have been felled in Edinburgh's Princes Street Gardens to make way for a path giving better access for prams and wheelchairs. 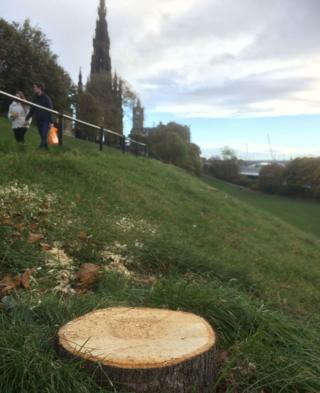 Edinburgh City Council granted permission for about 50 trees of varying ages to be cut down. The move is part of a multi-million pound project to revamp the Scottish National Gallery. Replacement foliage, including 22 large saplings, will be planted around the new path. The felled trees were between 25 and 35 years old. A spokesperson for the National Galleries of Scotland said: "We realise this is a sensitive subject and this decision was not taken lightly. "This will enable us to create a new, sloped path that will make the gardens and gallery fully accessible to people with mobility impairments, prams and pushchairs. "The reduction of the currently dense tree canopy will also recreate carefully framed views through the Gardens to the Old Town. "These views were part of the architect William Henry Playfair's original vision for this world-famous location, which is of primary significance to central Edinburgh's World Heritage Status. "The work will also involve the replanting of 22 large saplings and semi-mature trees, with species chosen to tie in well with existing trees in the wider gardens. These will be replanted in spring 2019." An Edinburgh Council spokeswoman said the work was "necessary". She explained: "The removal of trees as part of Scottish National Galleries' expansion of the National Gallery of Scotland is necessary to create a path which will significantly improve access to the gardens and National Gallery for the public, particularly those with disability issues or pushing prams." The spokeswoman added: "As part of the planning process it was required that trees are replanted once the path has been created and this will begin in spring, alongside the wider improvements."